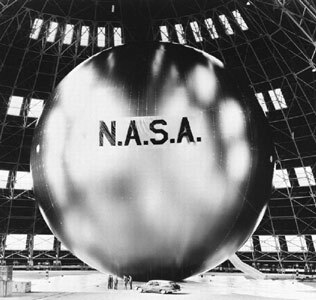 The Echo 1A spacecraft was a 30.48 m diameter balloon of mylar polyester film 0.0127 mm thick. The spacecraft was designed as a passive communications reflector for transcontinental and intercontinental telephone (voice), radio, and television signals. It had 107.9 MHz beacon transmitters for telemetry purposes. These transmitters were powered by five nickel-cadmium batteries that were charged by 70 solar cells mounted on the balloon. Because of the large area-to-mass ratio of the spacecraft, data for the calculation of atmospheric density and solar pressure could be acquired. The spacecraft was also used to evaluate the technical feasibility of satellite triangulation during the latter portion of its life. The spacecraft re-entered the atmosphere on 24 May 1968. Echo 1 failed during the coast period after launch, as the attitude control jets on the second stage failed and the spacecraft did not achieve orbit. Echo 1A was a successful relaunch.